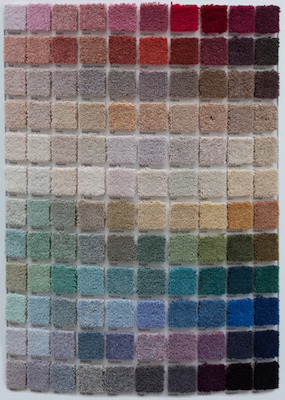 Shop around for new carpet and you’ll quickly discover that the most used carpet fiber materials are nylon or polyester. Both have their own characteristics. Both can make excellent choices. Which is right for you? While nylon and polyester are quite different in feel and performance, they do share a few characteristics. Both, for example, are petroleum based synthetics. Nylon was invented as a silk substitute. Polyester was developed as an alternative to wool. While both products are derivatives of petroleum, they are produced in different ways. Nylon is an engineered fiber made in a factory from petroleum. About 65 percent of all carpet created today is produced from nylon that is newly created, with only a select amount of nylon made from recycled nylon. Polyester used for carpet is made from recycled products such as plastic soda or water bottles. That makes polyester fibers more environmentally friendly than many nylon options. Nylon is very hard, which is why it’s a durable product for carpet and rugs. When dirt gets into carpet, the sharp edges can cut into carpet fibers. Because of nylons hardness, it slows the process considerably. Nylon also has a better bounce-back feature than polyester. Walk on it and you’ll find the fibers return to their upright position easier. And if you find marks after furniture has been sitting in the same spot for some time, they will be easier to get rid of with nylon. While polyester isn’t nearly as durable as nylon, what it makes up for is found in the softness level. Polyester carpets are easy to sink your toes in, providing warmth and comfort. Both nylon and polyester come in a wide variety of color and style options. You’ll find both kinds of carpets offer easy cleaning and easy maintenance, with a variety of stain repellent options. And both types of carpets can be recycled after use. Which is better for you, nylon or polyester carpet?